Monster Jam was on Saturday night. 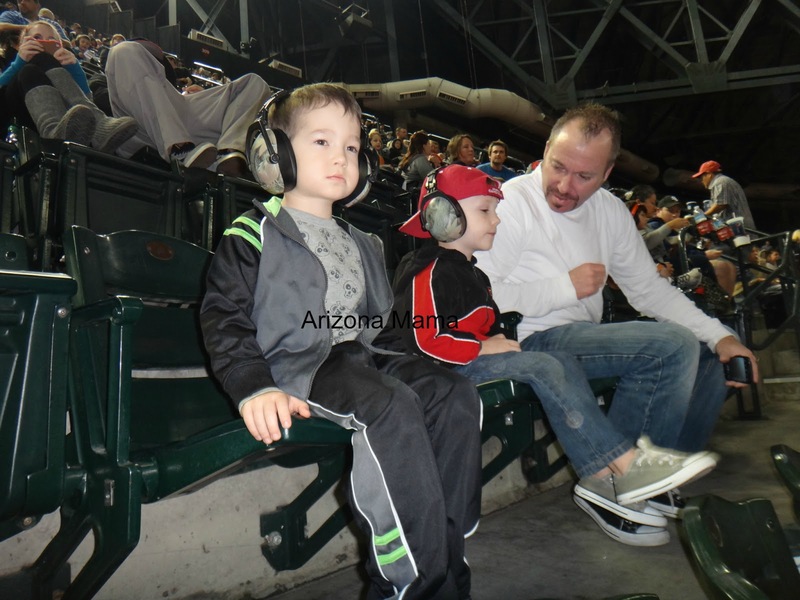 Jayden was so excited to see all the monster trucks. 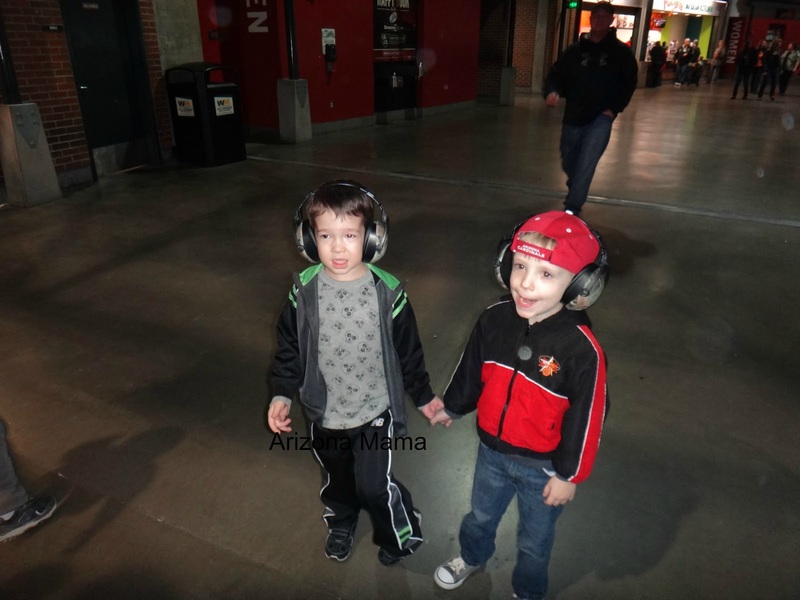 John and Jayden looked up on the Internet to see which monster trucks would be there. Some they knew and some they did not, but either way they were excited. 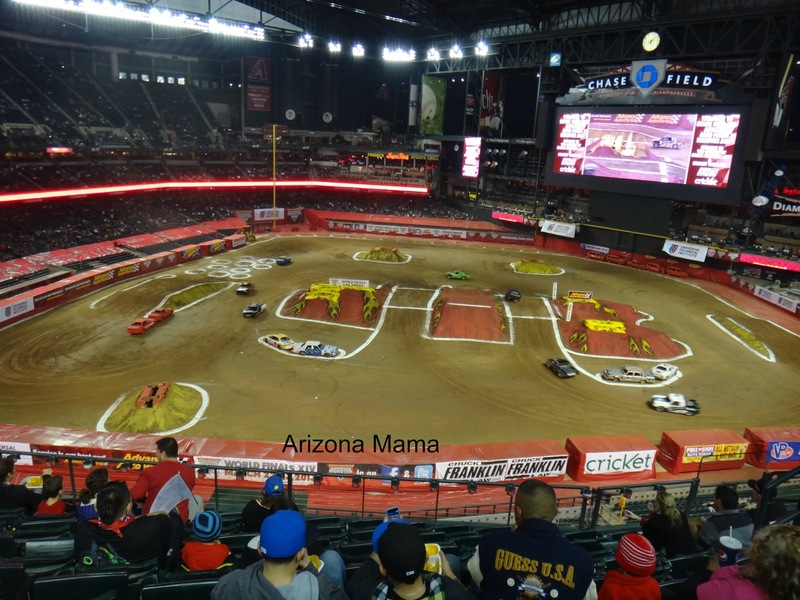 Prior to the show they had a meet and greet where you could go down on the field and see the monster trucks as well as meet the drivers. I really wanted to take Jayden to this, but was unsure if we had access to these tickets. John did not want to drive all the way downtown to check and if we didn't have to drive all the way home. So we decided to show up just before the show began. Unfortunately they did have those tickets and we missed out. I was pretty sad about that, but at least we know for next time. On the way to the show we stopped and bought Jayden and his cousin a pair noise reducing ear muffs. It gets really loud with all those loud monster truck engines so I wanted to be sure Jayden's ears were covered. 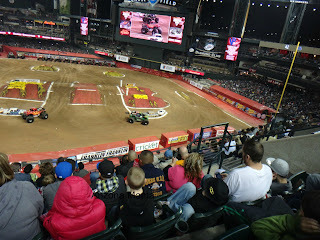 As we approached the Chase Field it got more and more exciting. There were people everywhere, even with all the rain. Once inside the boys found their seats and they were perfect, not too far, but plenty far away to be able to see everything. 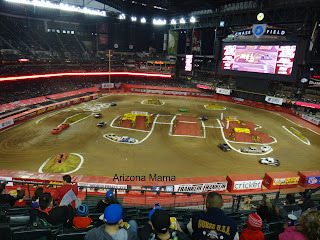 Prior to all the monster trucks coming out there were lots of other races, like motorcycles, quads, trucks, and more. 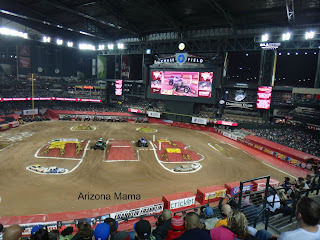 Jayden loved watching these, but was so excited to see the monster trucks. 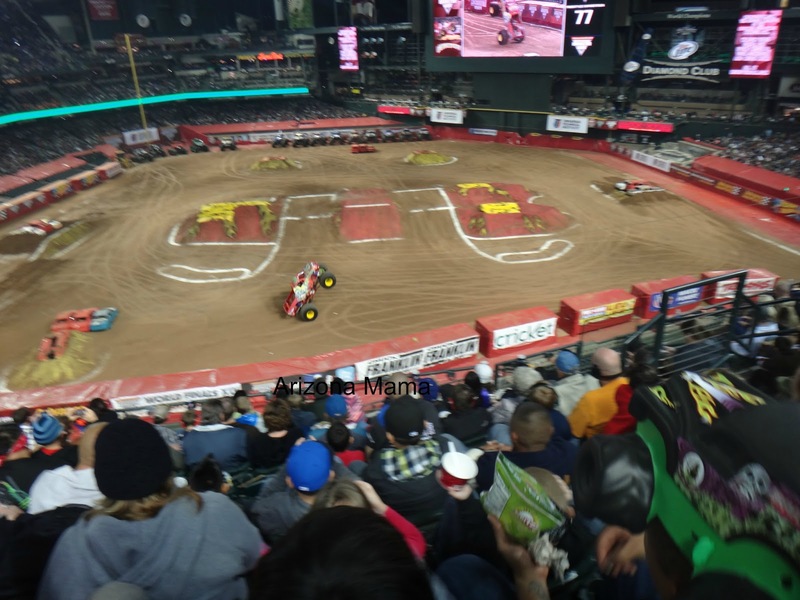 The monster trucks came out and the ballpark filled with a roar of cheers. The race began. There was so much excitement. 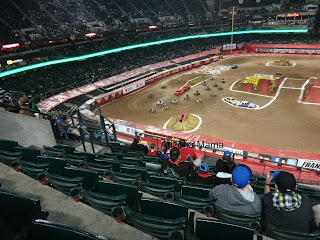 The winner of the race was the Monster Energy truck. 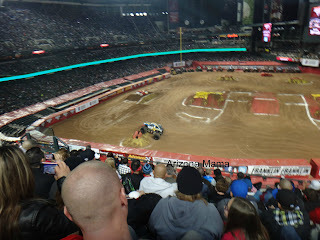 Grave Digger should have won, but he had some engine trouble. 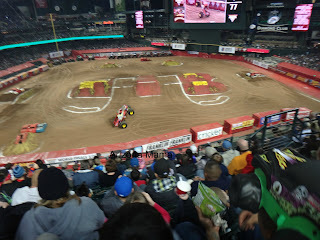 Finally after the races the freestyle started. Jayden's favorite part of monster trucks is the freestyle. The only bad thing is that it was already really late. Jayden was getting really tired. So John decided to leave before it all ended. 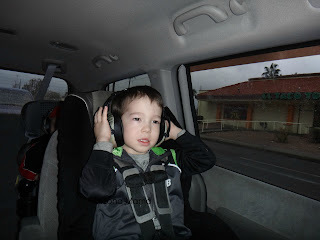 Jayden has been so excited and telling everyone how much fun he had. He just talked to his grandma today. The first thing he said was, "Max-mum (Maximum) Destruction was not there. But there was a police truck, it had lights and sirens. The quads race and the motorcycles too." As you might guess Jayden loves Maximum Destruction and he was a little disappointed that he was not there. The show delivered a fun and exciting night for sure. I look forward to next year when they are in town again. Monster Jam is making their rounds around the states now so check to see if they are visiting a city near you. I'm genuinely fortunate enough to get found your entire webpages and check to more exciting moments looking through below. Thank you with regard to almost everything. Wow this sounds like so much fun. I would love to take my grandsons to something like this. They would enjoy it so much. That looks like a great event and so fun! I've never been to one but they may have them here in Florida. My boy once he grows up i'm sure would love to go to this!